Nintendo president Satoru Iwata doesn't fear failure - he sees it as an inevitable part of Nintendo's innovation. With the costs of game development being what they are, it seems like the go-to strategy for most large companies is to take as few risks as possible. Well, Nintendo isn't most companies. Nintendo CEO and president Satoru Iwata says that failure is something that will always happen in the creative process, and he just has to accept that. "When we talk about Nintendo we cannot ignore (former president) Hiroshi Yamauchi who just recently passed away," Iwata says. "He always said that if you have failure, you don't need to be too concerned. You always have good things and bad, and this reflects the history of Nintendo." The attitude fits with Nintendo's design philosophy: while other competitors are racing to perfect very similar technologies, Nintendo is usually the odd one out, for better or worse. 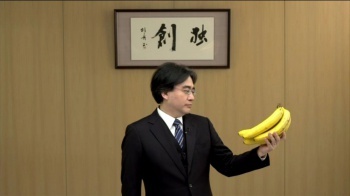 "If you do the same thing as others, it will wear you out," says Iwata. "Nintendo is not good at competing so we always have to challenge [the status quo] by making something new, rather than competing in an existing market. Iwata cites the Pokemon franchise as an example of Nintendo making a strange call that paid off in the end. "Will America accept cute monsters? No, they said. Some people even recommended to make Pikachu more muscular. If we followed their advice Pokemon would never have been the success that it was." It's hard to imagine Pokemon as anything but the runaway success it is now, but that just reinforces Iwata's trust in unconventional tactics. Nintendo's design decisions are largely hit or miss, but when they hit, they hit hard.